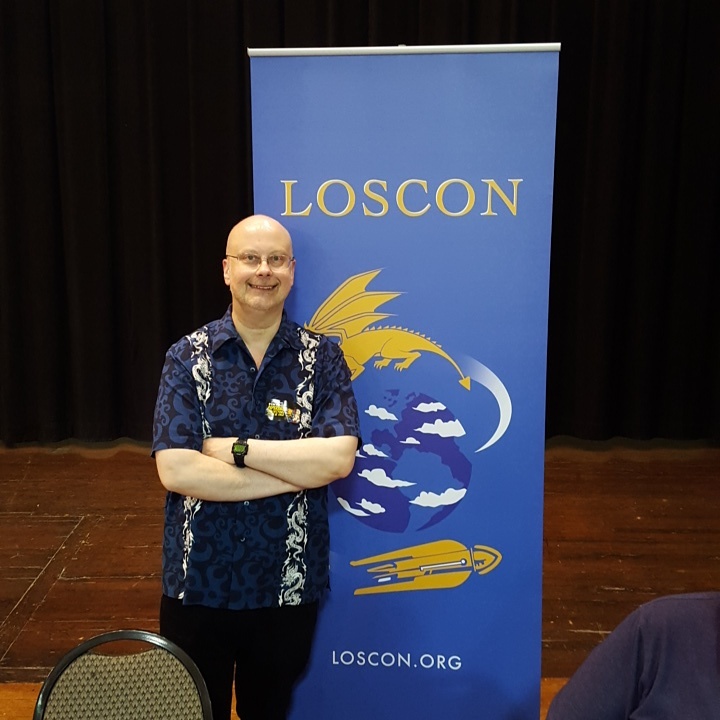 Loscon 46 will be held November 29 – December 1, 2019, at the LAX Marriott. Further details to be announced later. By John Hertz: June’s local club was, and mine is, the Los Angeles Science Fantasy Society. She died on May 31st. She was my longest-time friend in fandom. LASFS (to me and many, pronounced “lahss fahss”; to June’s late husband Len rhyming with sass mass) was founded in 1934. Our memorial for her was June 28th. We meet every Thursday; it was our 4,220th. No one could take Our Gracious Host’s place, but I told him that if he couldn’t attend I’d take notes. On the way I found classical-music radio Station KUSC broadcasting Chopin’s Waltz No. 9 (Op. 59 No. 1, 1835) “L’adieu” played by Garrick Ohlsson. We’ve been renting the Null Space Labs in North Hollywood. We outgrew our third clubhouse, sold it, and are looking for a fourth. Our meetings start at 8 p.m. This time we thought we ought to serve snacks, so we did that starting at 6. We’d had another blow that day: Harlan Ellison. He would have a separate memorial. Club business didn’t take long. Usually a lot is monkey business. We left that out and went on to what the unusually large attendance had come for. June’s oldest son Bob Konigsberg had been able to visit her from his home in Los Gatos three hundred fifty miles away. I’d sometimes found him at Moffatt House, serenading her. Tonight he told us she loved railroad songs, like “The Wabash Cannonball”. A gadget in Bob’s hand, coupled with one Matthew Tepper had, let us hear from June’s daughter Caty, still on the road. It’s called Bluetooth, I muttered to Lee Gold, because you put it in your ear. You know it’s named for Harald Gormsson, she muttered back, quite rightly shushing me as I started to explain that the Greek dance Hasapikos (Turkish kasap, a butcher) is so called because sailors do it. Caty told us she’d seen how much LASFS meant to her mom. As it happened no one broke into “Mutual Admiration Society” but we could have. June and Len were like that too. Caty thanked us all and said she heard us thanking her. Barbara Gratz Harmon had married Jim Harmon about the time June married Len. They had double-dated. Len and Jim both died in 2010. Tonight Barbara talked about June. Barbara lives in Burbank; the Moffatts lived in Downey. With Len and Jim gone, June spent Thursday nights after LASFS meetings at Barbara’s, and drove home the next day. Barbara is a cellist in several orchestras. When she had to practice late at night, June took out hearing aids and slept jes’ fine. When Barbara was on jury duty for five months, June had a key to the house. Barbara’s dog Leslie loved her. June became unable to drive. She passed the written exam but couldn’t see well enough. Carol Sperling, among other things founder of the Blustering Gales, a local Sherlock Holmes club – detective fiction was another Moffatt interest – told us about taking June around. George McUrso did some of that too. Eventually he had, as regular Thursday night passengers, June, Barbara, Charlie Jackson, and Rowan Dao (who was also the youngest Blustering Gale). In 1991 George (then using the surname Mulligan) had been given the Evans-Freehafer Award for service to the LASFS; he was one of June and Len’s nominators when they were given the Evans-Freehafer in 1994. Matthew Tepper said June had agented his Lzine when he lived in Minneapolis and San Francisco. She asked him to find music for Len’s LASFS memorial. Tonight he began to play it from a gadget he had – “No, that’s Mussorgsky” – then we heard “I Go Pogo”. The Moffatts were Pogo fans. Barry Gold had found LASFS in 1964. June’s equanimity and aplomb, he said, had won her the name Mother Jaguar. June and Len made him feel he’d known them for ages. Near the end while visiting her he’d sung “Bouncing Potatoes” and told Bob Konigsberg how Poul Anderson was driven to write it. Charlie Jackson said he’d just finished re-reading The Wind in the Willows when she died. Comments in her APA-L zine were headed “Onion-Sauce” (ch. 1). With Len and June, he said, as we agreed, seldom was heard a discouraging word. Ed Green said there was no bigger heart than Len and June’s. They sponsored people, including him. A bright light had gone out. I said – there was more, but I’ll stop here – Judaism taught that, whatever else after death there may be, the dead live in their good deeds. And we should take the torch. Some of this is also in Vanamonde 1308. By Bill Higgins: This item is five years old, or in another sense, twenty-six, but I’ve just learned of it. In 2012, Mr. Tepper contributed to YouTube a 1991 audio recording of Asimov, aged 71, singing all four stanzas. Though Asimov’s wit was renowned, he performs here in perfect seriousness. In this moment, while Americans are focusing new attention on “The Star-Spangled Banner” and the meanings with which we invest it, it may be interesting to hear it sung by one who, while granting that his nation had its flaws, greatly loved its anthem– all four stanzas of it. 2016 Vintage Paperback Show, panoramic view. Photo by John King Tarpinian. The 37th Los Angeles Vintage Paperback Show took place April 3 at the Glendale Civic Auditorium. It’s a great event. I really enjoyed it. Book dealers fill the exhibit hall, and at a row of tables next to the stage waves of writers and artists autograph their works for fans, free, throughout the day. Some of the people signing when I first arrived were Karen Anderson, Barbara Hambly, and Tim Kirk. Joe Lansdale and his daughter, Kasey, were at one of the dealers tables. 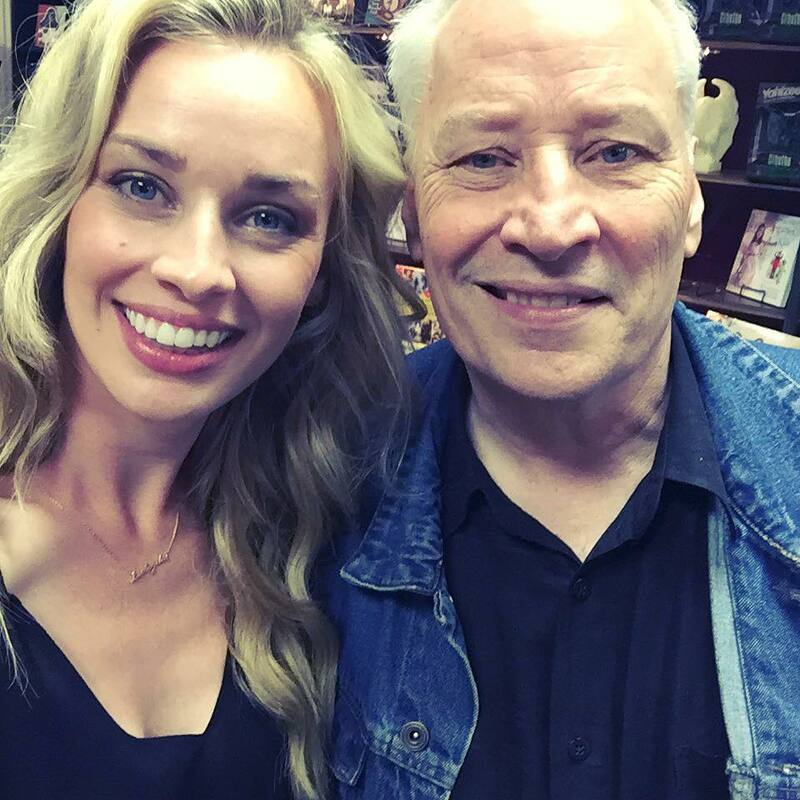 Kasey Lansdale and her father Joe Lansdale. On the way in I met Tim and Serena Powers. Tim said he looks in on the File 770 blog, which was nice to hear. I had a long conversation with Marc Schirmeister, who I last saw at Sasquan. I met artist Tony Gleeson for the first time – an artist often mentioned here in news stories — and he in turn introduced me to author Odie Hawkins. Quite a few LASFS members were present — Matthew Tepper, Michelle Pincus, Karl Lembke – in addition to the member/authors who were signing. I hear Robert J. Sawyer visited the Loscon table later, after I had gone. Robert J. Sawyer. Photo by Michelle Pincus. The event staff were doing a really good job — seemed to have an eye open for everything, and treated people very nicely. I can’t end without mentioning the Civic Auditorium’s rather odd parking structure. The property is built into a hillside. You enter the structure on the bottom level, as you would expect, however, to exit you have to drive all the way up to the roof — which puts you on a level with another driveway to the street. Debra Levin and Matthew Tepper wed in a Jewish ceremony at the LASFS clubhouse on June 30 in the presence of about 75 family members and friends. A canopy lifted on four poles was carried into the main meeting room by members of the wedding party including John DeChancie and David Gerrold. The canopy was blue fabric with an elaborate yellow design. The principals came forward in procession, Rabbi Marcia Minsky, who presided over the ceremony, Tepper in a top hat and black tuxedo, and Levin wearing a white wedding gown beautifully trimmed in lace. Minsky was assisted by Mark Poliner. Tom Safer cued the music. Other participants included Joyce Sperling, Eylat Poliner, Charles Lee Jackson II and Jerry Pournelle, plus several more whose names I didn’t know. At the appropriate point in the ceremony, various people had the honor of reading one of the seven blessings, in Hebrew if they were able, otherwise in English translation. Jerry Pournelle recited the third blessing in English: “Blessed are You, LORD, our God, sovereign of the universe, who creates man.” Barry and Lee Gold did a glorious job reading the lengthy seventh blessing, first in Hebrew, and then in translation. Matthew waved off the applause that began when people thought the service had ended, because he still needed to stamp on the glass – then the couple was introduced and applause resumed. LASFS officers figured prominently in the service. The groom is club president, while his bride is vice-president-elect. Marcia Minsky and Eylat Poliner, are co-vice-presidents, and Charles Lee Jackson II is a Special Advisor. It was a great occasion, and a chance to greet some old friends including Elst and Carole Weinstein, Regina Renante, Marty Cantor, and quite a few of those named above. Debra Levin and I plan to get married this coming October. At present I’m 58 and she’s 45. This will be my first, and her second; she is the widow of Rob Levin, aka “Lilo,” founder of Freenode. The long-time bachelor says that when he announced this news at last Thursday’s club meeting he asked Karl Lembke to play “The World Turned Upside Down” on his computer. I know that tune was played when the Brits surrendered at Yorktown. But I asked him if the reference is apposite – after all, Matthew wants to surrender to matrimony! By John Hertz: If you thought an 89th-birthday party for Ray Bradbury at a bookshop would be crowded, you’d be right. If you thought it would be an occasion to buy his books and get them signed, you’d be right. As June Moffatt said when I reported by phone, these were good things. Bookfellows, 238 N. Brand Bl., Glendale, CA 91203 (also called “Mystery and Imagination”, the name of their Website), is a new- and used-book shop with a fine s-f stock. The party started at 1 p.m. on Saturday, August 22nd, Bradbury’s actual birthday. The Cosmic Joker keeps making me type “Bardbury”. This too may be a good thing. On a giant greeting-card shopowners Christine & Malcolm Bell had written “You’re a living book”, so below I wrote “because you’ve set us all afire”. A chocolate cake with orange icing was decorated with a Jack-o’-lantern wearing eyeglasses. We all sang “Happy Birthday”. Outside, which was no less crowded, only different, George Clayton Johnson was talking about heroes. I said, “You yourself are one of the heroes.” He said, “You’re observant as ever.” I bowed. He did too. Inside, Matthew Tepper and Charles Lee Jackson II told me they hadn’t known about the party, just came looking for books. Tepper said, “This is the second time I’ve gone to a bookshop and found Ray Bradbury there.” It was so crowded Tepper took out a handphone and called Christine Bell to ask whether she had a book he wanted. Bo Derek brought Bradbury a birthday present, which shows how little I know about celebrities. It was a good party. The Los Angeles chapter of the Science Fiction League (No. 4) began meeting in 14-year-old Roy Test Jr.’s family garage in 1934. On October 28, the Los Angeles Science Fantasy Society celebrated 70 years of friendship and fanac. Founding member Forrest J Ackerman performed the duty of gaveling the 3,507th meeting to order with President Van Wagner’s pink plastic lobster. For Ackerman, Len and June Moffatt, this was their second consecutive day of celebration. A group of eofans gathered on October 27, the real anniversary, at their old stomping grounds, Clifton’s Cafeteria in downtown LA. Local TV news covered the get-together because it also included those teenaged fans who grew up to have stars in the Hollywood Walk of Fame, Ray Bradbury and Ray Harryhausen. The October 28 club meeting drew around a hundred fans, about evenly divided between the usual crowd of active members and old-timers from bygone decades. The more widely-known regulars included John Hertz, Joe Minne (who introduced me to LASFS), Rick Foss, Matthew Tepper, Elayne Pelz, Drew Sanders, Charles Lee Jackson 2, Marc Schirmeister, Marty Massoglia, Christian McGuire (L.A.con IV chair), Francis Hamit, Leigh Strother-Vien, Ed Green, Liz Mortensen, John DeChancie, Marty Cantor, Tadao Tomomatsu (“Mr. Shake Hands Man”) and Mike Donahue. Some of the graybeards present were notables in national fandom back in the day, like Arthur J. Cox, and others remain well-known, like Fred Patten, John Trimble, William Ellern, Dwain Kaiser and Don Fitch.